To technically appreciate bicycle racing in the Tour de France is to fundamentally appreciate Newtonian physics, although purists will disagree to such bland reductionism. If you want to race up a steep mountain road, you need a net human power exceeding the retarding effects of tire rolling resistance and gravity. When the road is a bit more nice and flat and where you tend to reach higher speeds, you need a net human power exceeding the retarding effects of aerodynamic drag. If you have large pockets, have your own bike fitted with a cycling power meter and inspect the wattage as you pedal. If you're savvier with numbers, fire up an MS Excel and program a little spreadsheet based on the math described in this paper by Martin et al titled "A Mathematical Model for Road Cycling Power". It should give you numbers that are unsurprisingly close enough to the reading from a power meter (exception to high windy days) because as mentioned earlier, cycling is Newtonian physics. The figure of merit for a Tour de France cyclist can be represented in terms of speed, absolute power, or power to weight ratio. Since the Tour is always decided in the mountains, being able to ride a bicycle uphill for long periods of time at somewhere between 10-15 mph (16-24 kph) is top class. During a sudden acceleration, a strategic move called an "attack" in cycling, being able to punch 18-20 mph (29-30 kph) for 10-20 seconds at a time is sheer top class. Power wise, being able to maintain between 330-350 watts for 20 or more minutes is great, somewhere around 380-400 watts or greater is top class. Power to weight ratio wise, a figure between 5.8-6.0 watts/kilogram is what it takes to deliver serious firepower in the mountains. Therefore, it doesn't assist you if you weigh 100 kilos rather than 70 kilos, because 70 x 6 = 420 watts is easier than 100 x 6 = 600 watts to do the same job. The power to weight ratio allows for comparison between different riders. Since margins at the Tour is over minutes and seconds on a climb, a difference of 1 watt/kilogram between two riders makes the difference between sitting overall in top 10 or sitting overall in top 20 spot. In terms of money, that's worth something to a guy who earns his bread racing a bicycle. It's really as simple as that. Riders often "warm up" on stationary bikes before the start of a stage, particularly before the start of a time trial, which is an individual race against the clock. They have a warm up routine, an instruction telling them how many minutes to spend at specific power levels. 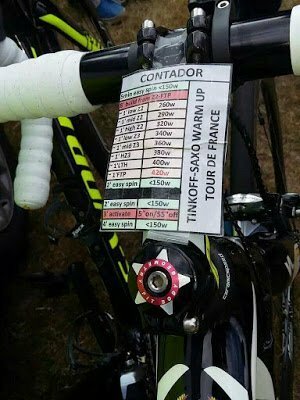 Below is such a warmup sheet pasted on Alberto Contador's bike during a recent Tour de France. Alberto is a top tier professional cyclist and rides for Team Saxo Tinkoff. Inspect the numbers. He is asked to warm up at less than 150 watts, ramp up his output from there 30 watts each time all the way to 420 watts, followed by an easy spin at less than 150 watts. For an average individual, reaching 380-420 watts for extended periods of time can involve profuse sweating, high heart rates and dry-as-bone breathing. A recent video posted online (see below) by hackers shows power and speed data of Chris Froome from Stage 15 of the 2013 Tour de France. On this particular day, Froome became the first British rider to win on the high mountain road to the summit of Mont Ventoux. Known as the "Giant of Provence", this road has a staggering average gradient of 7.6% for 21 kilometers. Froome would go on to win the 2013 Tour de France. 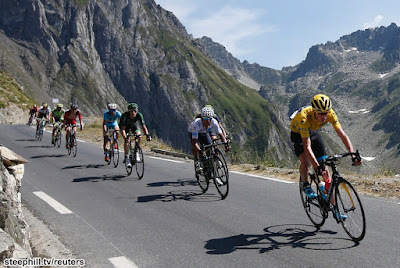 The Tour is especially interesting because of these dramatic incidences, where a community of rabid fans view extraordinary cycling performance and begin to have their own doubts about them. While there are people who can make careless mistakes with statistics, a simple understanding of physics and the records broken in the past Tours can tell any average Joe what might be possible in the realm of "ethical" sporting. I leave any judgment of Froome's performance aside and simply enjoy the action.